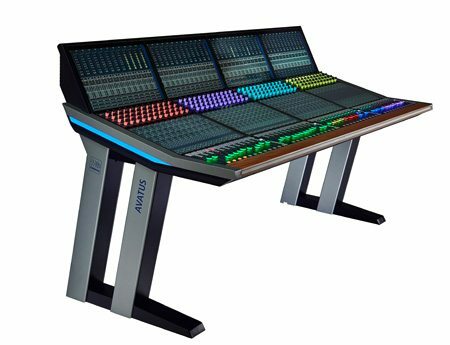 The latest generation of the CRESCENDO medium size digital audio mixing console is intended for live production in TV, radio or theatre. 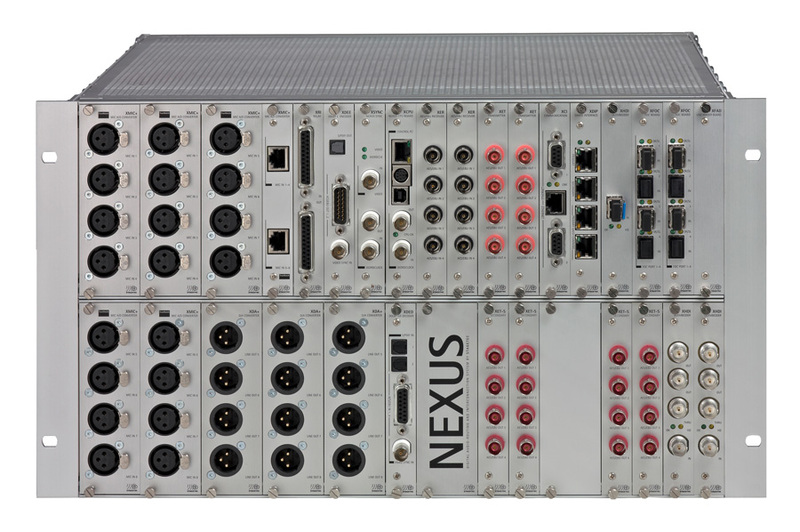 Using the Nexus Star router as its DSP core, it offers over 500 audio channels and 128 mix buses. The system has great flexibility of I/O formats and synchronisation options, and the NEXUS networked router concept allows the console to operate with off-site sources and destinations as well as local. Surround formats up to 5.1 are supported. Local analogue I/O for talkback, nearfield monitoring, third-party external metering, etc. See also the entries for Nexus and Nexus Star routers for information regarding the central DSP core and I/O hardware aspects of the CRESCENDO platinum. The Stage Tec CRESCENDO platinum is a digital audio mixing console offering a large feature set in a compact surface (only 530 mm depth without the armrest), and is designed to allow the engineer to cope easily with the heavy and complex workload common in today’s on-air and theatre environments. It is an evolution of the CRESENDO console, and combines the best features of CRESCENDO with recent developments in DSP design and capability. The console is effectively a manual control surface for the mixer DSP, which is embedded in a Nexus routing system, and uses 40-bit floating point processing for excellent audio quality. All main system audio inputs and outputs are connected via one or more NEXUS base devices (frames), which may be located anywhere in the facility, or off-site. These link via fibre to a NEXUS Star central router unit which provides the system’s DSP capability; this is also connected via fibre to the CRESCENDO platinum surface. The surface itself only has local audio for talkback, nearfield monitoring, etc. If a NEXUS system is implemented as the facility’s main audio backbone router, the mixing console simply forms part of the system, and has access to any sources or destinations connected to NEXUS. The modular design of the NEXUS racks permits enormous flexibility in I/O configuration. Almost any combination of analogue and digital audio formats may be specified to suit the facility’s infrastructure; options extend to MADI, SDI, AES3, Dante, AES67 and Ravenna with copper or optical I/O as well as mic or line analogue, and AES3. NEXUS frames are fully scalable, and the system is thus future-proofed as further audio formats are introduced. CRESCENDO platinum’s ergonomic layout simplifies both system setup and the audio mixing task itself. It may be specified with up to 56 channel strips (in blocks of 8): the central master section may being specified at any position in the frame. The channel strip’s local controls are reduced in number both for greater clarity and footprint reduction, though full control over all signal parameters is always available through the central control area. Each strip can control up to 8 different audio channels by the use of layers. Assignment of audio channels to channel strips is via the Layer panel in console’s master section, which also controls which layer is active on a global or 8-channel panel basis. Further, two layers are always instantly accessible on every channel strip by a local toggle button. The currently-selected source is indicated by an alphanumeric display next to the fader. Audio channels may be freely linked to form stereo pairs or 5.1 stems as needed, and controlled by a single strip. Each channel strip has six dual-concentric, touch-sensitive rotary encoders, each with an associated LED fan display. Two of these are input and pan controls, the other four are switched between EQ (4-band parametric) and aux send/N-1 functions with a single button press. Other channel functions, including dynamics (compression, limiting and expansion), A/B input selection, bus routing and channel delay (up to 2.7 s) are controlled from the master section. 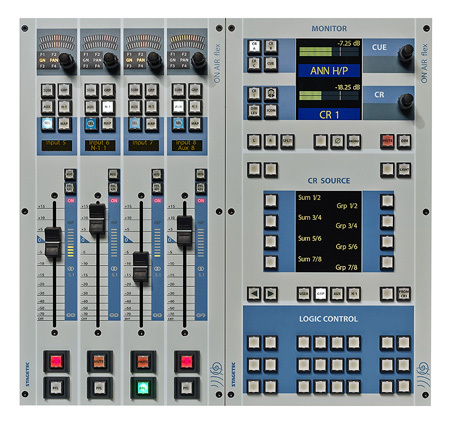 CRESCENDO platinum may be freely configured to suit each mixing session. Configuration parameters include numbers and width (mono, stereo or 5.1) of buses, I/O allocation within the Nexus frames, allocation of audio processing channels to channel strips and layers and monitoring setup; console configurations may be saved as Project files for immediate setup of regular tasks. Additionally, the console’s snapshot automation system can store a complete set of control settings for subsequent manual or automatic (time-based) recall. Hi-resolution TFT displays are used in the meter bridge above the master section and each channel strip block. Apart from bargraph metering (the meter style follows the channel mode assignment as mono, stereo or 5.1), the channel strip displays include EQ curve, bus routing, channel linking information, dynamics gain reduction, channel name and I/O port identification. The master section display can meter up to 96 bus levels simultaneously as well as mono, stereo or 5.1 master outputs. Large clock and timer displays, and GPIO indicators are built-in. The console system is provided with a variety of external control options: 16 GPIs and 16 GPOs are available both at the surface or the NEXUS frame, and remote access protocols supported include RAS, ROSS and Mosart. Extended Mosart control allows for variable crossfade times. CRESCENDO platinum is an economical system: a 32-layer surface only consumes 170 W of power. The surface has no fans, of great benefit in live theatre installations. As befits a console intended for use in the most prestigious on-air and live situations, full redundancy of power supplies for all components of the system (including NEXUS) is standard. Other reliability safeguards are the inclusion of redundant DSP, the availability of dual fibre links between NEXUS elements and automatic restoration of last-known settings following a power-down.